Well this is a surprise! Granted, it's a bit odd that they're releasing Christmas episodes on a non-festive DVD, but at least the UK doesn't have to wait that long for them, with the next three being released next week! But let's focus on the two released now first, and it seems they both involve Glynn the Coffeepot. An interesting idea since I'd written him off as a character whose only purpose was to pass the torch to Thomas. 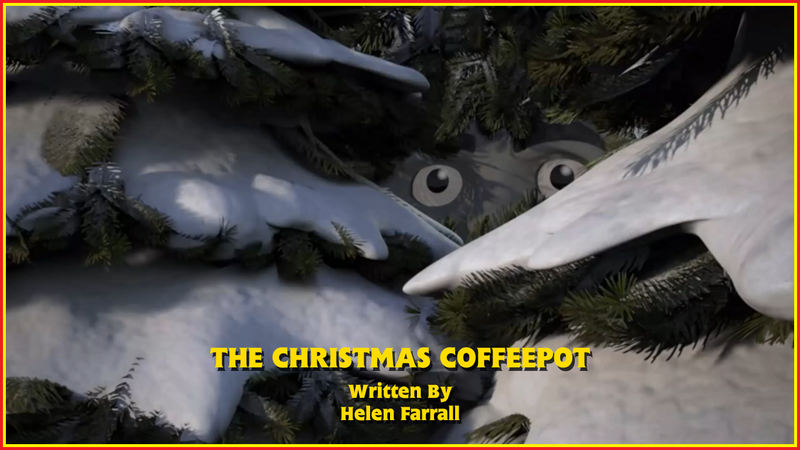 But how does his return in The Christmas Coffeepot fare? So this was a... fairly weak one, to be honest. It's definitely my least favourite that Helen Farrall has written, but it's not an episode that I dislike. The fact that this is her weakest is more a testament to how good of a writer she is and how well she understands the characters. And when I say that, I include Marion's portrayal here. If I complained about her character here, I'd have to do the same with her portrayal in Sodor's Legend of the Lost Treasure where she thought that there was only one Oliver on the island and the small engines were changing their appearance with magic. Her imagination has been known to run away from her at times, and the fact that Glynn was so well concealed behind the trees made her "this tree can talk" mindset a lot more believable. Also, for anyone wondering how she can be so quick to jump to weird conclusions in two episodes and a special while still managing to control Bill and Ben, the answer is simple: she's used to them. Seeing huge dinosaur statues, miniature engines and a voice coming from behind a small forest of trees is something she doesn't see every day; they can catch you off guard very easily. Meanwhile, she's with Bill and Ben quite often, so it's a lot easier to build up the right attitude around them, especially when they play their tricks. One funny moment, and one that felt very classic era-esque was that Thomas, Annie, Clarabel and Henrietta teased her for thinking that a tree could talk. It is a ridiculous thing for someone to say, and it makes more sense for characters to mock Marion than appease her. More of that in the future would be lovely. One other thing I'd love to see more of is these three together in a scene and/or episode or two in the future. I'm not gonna lie: not even I am immune to nostalgia, and this is a prime example of what gets me going. Sure, it had little to do with the story, but it made me happy, and that's what entertainment is made to do: make people happy. An interesting element that this brought up was the Eail mentioning that he will be adding a railway museum to the castle grounds. I honestly would've had it at either Vicarstown, Knapford or Tidmouth as those three are the biggest towns on the island. But considering the Earl seems interested in history, it makes sense that he'd build it near Ulfstead. I'm looking forward to how this develops over the next few months. I also like how they explained why Glynn was absent from the siding in Lost Treasure and series 19... kind of. It was relatively fine, but how did no one tell the Fat Controller that the engine that he helped to build had been found rather than move him from siding to siding just... because? And that brings me onto my biggest problem: why did Thomas and Percy think that Glynn would be scrapped? This trope has gotten really old since Squeak, Rattle and Roll 12 years ago, and here it's even more nonsensical as they should both know (thanks to what happened with Hiro) that the Fat Controller wouldn't scrap him, so that whole part felt really pointless. Maybe if they'd reassured Glynn that everything would be alright, or if they'd taken him to see Sir Topham while Glynn worried about his fate, it would've felt a bit more original and made more sense. As for the Fat Controller, this is just a weird point that I wanted to pick up on. It's one that was odd in The Adventure Begins but I'll mention it here: do the humans actually age in the show? If not, how do they stay the same age for so long? If so, how did the Sir Topham from the present day help build Glynn? As bad as Happy Birthday Sir! was, at least it gave a good indication that Sir Topham was just a regular person ageing normally, but now it's been forgotten about entirely. I honestly think it would've been better if they'd said his father had built Glynn, and the current Sir Topham had heard stories from him about the coffeepot he'd helped to build. One weird, and disappointing, scene is the one where Thomas sees Glynn for the first time in years... and acts like it's no big deal. He had more of a reaction to seeing Gator again in Long Lost Friend and they interacted for a similar amount of time in Tale of the Brave as Thomas and Glynn did. Heck, Thomas was more excited around Hiro in series 19, and they interact fairly regularly! Considering the responsibility that Thomas took on, and the fact that Glynn just disappeared after TAB, I think it would've been nicer, and more heart-warming, had Thomas shown more emotion that just saying "oh, you're that coffeepot engine I replaced." Another disappointment is Glynn's voice. Sure, he sounded like Skarloey in The Adventure Begins, but I was rather hoping that we'd get a new performer for him to make him sound a bit different, but nope. This voice is here to stay. It's OK, but you can't help seeing Skarloey in your mind whenever he speaks. All in all, this episode is heavily flawed, and definitely Helen's weakest episode so far. But there's something about it that makes me like it regardless. Its heart is in the right place, Marion's as entertaining as ever and it's nice that they've actually found a place for Glynn. It's just a shame that the story surrounding his overhaul is rather convoluted and, at this stage, overdone.